When we hear a buzzing sound outside, we instantly think of them; bees and wasps! Although summer is the peak season for these little critters to flock, it’s important to know how to spot their differences all year round. But what are the differences between wasps and bees? As they buzz by you, they seem to look the same and have almost the same aggressive nature. 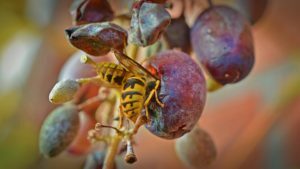 Protect yourself from a horrible interaction with these flyers by finding out the distinctions between bees and wasps. Bees are closely related to the ant and the wasp, but have some very different features and uses in nature. Known for their role with pollination, bees are an essential component in gardening. 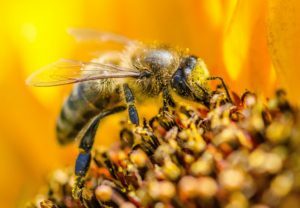 Because of a decline in wild bees, commercially maintained hives have had to go into place to make sure pollination in an area is maintained for a healthy plant environment. Most commonly known as a yellow jacket or hornet, wasps can be known to pollinate, but are mostly known as predators. Their most important form of pollination is that of fig trees, which would not be around if it weren’t for the wasp. They also been known to help in grape production as they pass needed yeast back and forth. However, as predators, their main job is garden pest control. They’ll eat bugs that hurt your garden or feed them to their broods. Some individuals flinch at just hearing the mention of wasps and bees, as these buzzing insects tend to inflict harm when you provoke them. But you don’t have to live in fear when you begin to distinguish the difference between the features of bees and the features of wasps. The size and physical differences between a wasp and a bee may not seem too different. However, on closer inspection, from the safety of a computer screen, bees and wasps can be differentiated pretty easily. The much more slender wasp tends to not have hair like bees do, and much more slender legs. Their bodies are built for hunting other insects and speed when flying. A wasps coloration is also much move vivid, while the honey bees or bumble bees have much more hair and their coloration is much more subdued. Their big legs and hairy bodies help them collect pollen. The ways bees and wasps live are very different as well. Although some types of bees do live by themselves, most bees live in colonies, with honey bee colonies being among the largest. Their hives are built out of wax which they process in the act of gathering and eating honey. Most bees’ hives are located in hollowed trees, the ground, and sometimes in buildings. Wasps, on the other hand, can live on their own and when they do live in colonies they are much smaller than bee colonies. Wasps nests are constructed out of fiber and saliva for a more papery home. The big difference between wasps and bees is their eating habits, as wasps go for more human food—unlike the pollen and flowers bees eat. Wasps like to feast on the same food we love, which is why you often see them enjoying your picnic alongside you. Along with human food, some wasps enjoy other insects and sometimes will steal bee honey as well. Bees’ diets are much more narrow, and they indulge their cravings on nectar and pollen. Once a bee has stung its human victim with its barbed stinger, the bee sting stays in the victim. If it’s torn out of the bee’s body, that leads to the bee dying within minutes.. Bees also don’t hibernate with the seasons, and wasps tend to sleep through the cold winter. Bees may seem like they are sleeping, but they are very much awake, eating honey they have reserved for the winter and clustering together to create heat to keep their colony warm. Do You Have More Aggressive Bees Near You? Africanized honey bees are similar to the aggression of wasps, which makes them dangerous to have around your home. Bee Master of Las Vegas offers bee relocation in Las Vegas to prevent an unfortunate incident from occurring to your family. Contact us today for our help!